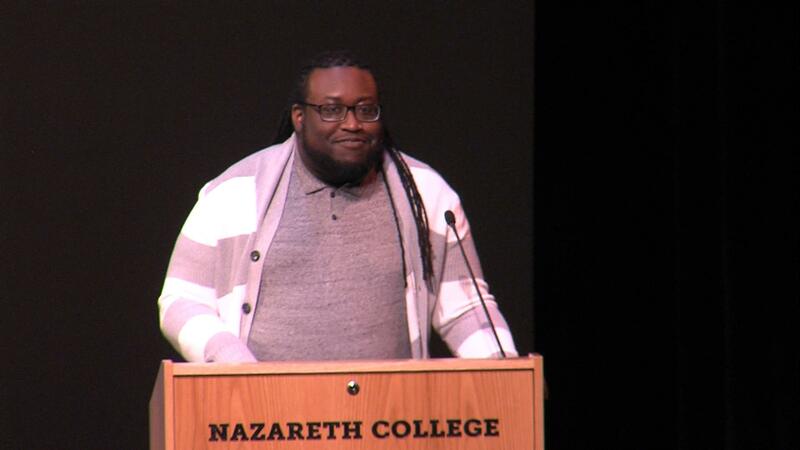 Rochester celebrates legacy of Dr. Martin Luther King Jr.
Olajiwon McCadney, Nazareth's director for Diversity and Inclusive Excellence, said we must make individual choices to bridge the gaps between the races. People across Rochester gathered Monday to celebrate the life and legacy of civil rights leader Dr. Martin Luther King Jr.
"Walk in the Light" was the theme of the Community-Wide Celebration held at the Eastman Theater's Kodak Hall. Community members sang and danced to "This Little Light of Mine" and heard a keynote speech from the Rev. Stephen Cady, the pastor of Asbury First Methodist Church, which focused on acknowledging and overcoming racism in our community. Mayor Lovely Warren said she wants Rochester to take advantage of this moment to heal our racial divides. "What's happening is nothing new," Warren said. "It's just that we have a light shined on it right now. It's time that we as a community come together. To really deal with it. So that we can move forward. For the sake of our children, for the sake of the next generation." The next generation was out in force at the Dr. Martin Luther King Jr. celebration at Nazareth College. Those in attendance stood and sang "Lift Every Voice and Sing," which is widely known as the "black national anthem." The theme for this ceremony was "The Other America," which is the title of a speech King delivered at Stanford University that focused on race, poverty and economic justice. Nazareth's speakers touched on the same themes. Sister Barbara Lum was Nazareth's keynote speaker. She's a Nazareth graduate and member of the Sisters of St. Joseph of Rochester. The Sisters of St. Joseph founded and operate St. Joseph's Neighborhood Center in Rochester's South Wedge neighborhood. The center offers free and low-cost medical care to all without insurance. Lum's speech centered on her experiences when her order operated a medical center in Selma, Alabama, during the 1965 marches from Selma to Montgomery. To this day, U.S. Rep. John Lewis of Georgia, an associate of King, credits the Sisters of St. Joseph of Rochester with saving his life after he was beaten during the march. She said that King has been an inspiration for her work. "I think it's important that we take away today what he stood for," Lum said. "One of the things that he talked about was that he decided that hate was too great a burden to bear and that he was coming down on the side of love. And I think that message is one that we could all reflect in our own lives. How are we living that message of Dr. King and many other great religious leaders?" Olajiwon McCadney, Nazareth's director for Diversity and Inclusive Excellence, agreed with Lum's sentiment. He said we must make individual choices to bridge the gaps between the races. "It's an opportunity to renew our faith in each other," McCadney said. "To renew our energy toward collective liberation. And acknowledge the fact that we still have work to do." Nazareth College is among many local organizations planning to participate in the "King for a Day" service program on Saturday. The program aims to put King's message of equality into practice in the community.